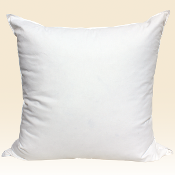 Our bed pillow inner shells are imported, and made of 100% white cotton, with a thread count of 230 to 300. We offer a choice of 25% white goose down/75% white goose feather, 50% white goose down/50% white goose feather, or all down fill. All bed pillows filled full and plump! Eurostyle Square Pillow 26" x 26"
King Size Rectangular Pillow 20" x 36"
Rectangular Travel Pillow — 16" x 20"
Rectangular Travel Pillow — 14" x 18"
Queen Size Rectangular Pillow 20" x 30"
Standard Size Rectangular Pillow 20" x 26"
Copyright © 2012-2019 Standard Feather Company. All rights reserved.